With just one pitch Derek Jeter was able to flip the script on a wholly negative week of Yankees baseball that has felt more like a negative year. With his first inning home run, on his first pitch back since landing on the DL a second time, Jeter delivered the Yankees first home run since the All Star Break. Jeter’s efforts combined with big days from Ichiro Suzuki and Alfonso Soriano gave the stadium a 2003 feel to it, most notably because the Yankees were able to win a ball game despite getting a lackluster pitching effort from Phil Hughes. Soriano added a two run drive to Jeter’s solo shot before eventually winning the game in the bottom of the ninth with a single up the middle. The cloud of Alex Rodriguez is still lingering over the Yankees, while several other All Stars have been ruled out for the season already. 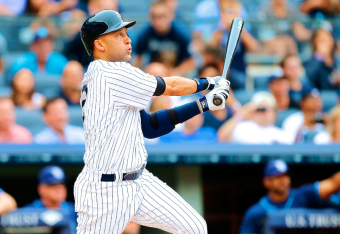 With the return of Jeter however the Yankees lineup is starting to have at least a small air of legitimacy to it. Throw in the professional bat of Soriano and the Yankees lineup may be ready to make this team a contender. There are still many holes in the lineup and some in the rotation, but as a whole this team has pitched so well that just a slight offensive improvement could mean a lot more wins. Hurting the Yankees right now is that they are looking up at a lot of teams in the Wild Card standings. Tampa Bay and Baltimore currently hold the two wild card positions, with Cleveland and Texas just a sliver behind. Right behind these two teams are the Yankees, just two and a half games back of Baltimore. It’s hard to say whether the Yankees are better than any of these teams, since for most of the year they have certainly not been on paper. When Curtis Granderson hopefully returns to the lineup in a week or so, the Yankees will probably be working with the strongest lineup they are going to have all year. If they can get to this point the time for excuses will be over, and the time for mental toughness and a return to contending baseball will begin.